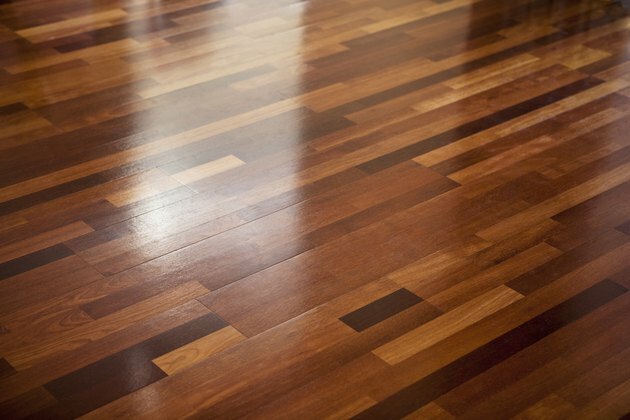 With oils, spray cans and many different kinds of wax on the market, polishing your wood can be a confusing chore. Which product to use depends partly on personal preference, but how the wood was finished determines the best wood polish to use. No matter which wood shiner you choose, the goal is to clean and protect the wood, as well as to enhance its natural beauty. The first step in deciding which polish to use is to determine the type of wood finishes on your existing furniture. If you don't know what your wood finish is, you're in danger of seriously messing up your new or preexisting furniture. It's important that you take the time to figure out the type of wood finish that you have before you attempt to clean the furniture. In order to figure out the wood finish you're going to rub a drop of oil into the wood; if it absorbs, your wood has an oil finish. If it doesn't soak into the wood, rub a cotton swab dipped in acetone in an inconspicuous spot. Acetone has no effect on polyurethane, but it will dissolve lacquer. If the surface turns gummy, the finish is either shellac or varnish. Rub denatured alcohol onto the spot: Shellac will dissolve, but varnish will not. Varnish, shellac and polyurethane finishes are simple to care for; you can clean and polish them with a homemade application of 1/4-cup plain vinegar mixed with 2 tablespoons of jojoba oil, or any other shelf-stable oil that won't quickly go rancid. Just spray the mixture onto a soft cloth; then wipe; spray-on polishes are safe for this surface. For a softer, more matte look, use a cream wax. Application is simple: Just rub it on; then wipe it off with a soft cloth. Gentle buffing brings up a low sheen. A lacquer finish requires the most work; for these, the best option is paste wax. Paste wax can build up, but it can be easily removed with equal parts vinegar and water applied with a little elbow grease. To apply paste wax, rub it on; let it set until dry, then rub it off and buff the surface. A dry cloth produces a low sheen; for a higher sheen, use a damp cloth. This is the one surface you don't want to use oil-based soaps on; just use water or the vinegar/water mixture and buff with a soft, dry cloth. If your finish has an oil base like linseed, tung or any of the oil-varnish blends, your polish choice is simple: Just use oil. Any oil will do and application is as easy as wiping it on, then wiping off the excess. Take care when choosing oils to avoid the type that easily goes rancid. Don't worry about buildup, and you don't have to remove old wax or anything else. The oil should soak into the wood and refresh the look of the finish. It may slightly darken the wood's appearance, especially if the wood was dry. Unpainted decks and outdoor furniture may have simply been sealed, usually with an oil-varnish blend, or they may have a varnish or polyurethane finish. If you don't know the finish, test it first. Outdoor wood finished with varnish or polyurethane should simply be cleaned regularly and refinished as needed. An application of cream wax can restore shine to aging finishes. Wood that has been sealed needs periodic reapplications of sealant. If water no longer beads on the surface, it's time to reapply.